At any rate, we went to the Gahan House, as it's the best place on PEI for a variety of craft beers. The quality varies between flavours / beers, but they do have some good stuff. 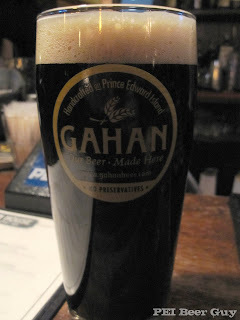 News to me (due to the Island/Canadian tradition of ignoring things at your own back door) was the fact that the Gahan does seasonal brews. Awesome. Not so awesome was back in December when their "seasonal" was what was left from the summer. When Chris and I went this time, they had a Black IPA. I was pretty stoked when our bartender (labelled as a hobbit by a patron on a previous visit) said this. I had just had Garrison's, plus the INK'D at the Hart and Thistle, and loved them both. I was ready. Longer story short, I was not impressed. The two glasses of Black IPA that Chris and I first got smelled and tasted completely different (first pours of the day, at around 8 or 9). It was either a dry-hopped version of their dark ale or stout, we thought. It didn't smell hoppy enough to be a blend of their 1772 IPA and one of their dark beers. In short, I did not like it, and it even made me feel a little cruddy the next morning, I think. The smell was very much like bubble gum (at least mine was), and the finish was akin to chalk. I would try it again, just in hopes that it was a couple of bad examples, but my hopes won't be too high. Still... keep it up, Gahan. I'm glad you're mixing things up a bit! I wish that they would put something on their website when they put out a seasonal brew or find soem other way of advertising it. I've heard that they have had raspberry wheat ale, OKtoberfest ale, and possibly a pumpkin ale many years ago but they only make small batches so if you don't hear about it right away, you miss out.